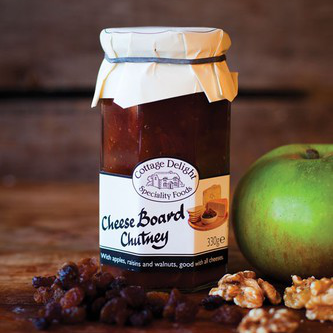 A luxurious accompaniment to any cheese board with a chunky texture and rich flavour to complement both soft and hard cheeses. Our fruity Cheese Board Chutney is made with Bramley apples, raisins and walnuts, lightly spiced with ground and stem ginger. A brilliant accompaniment to both soft and hard cheeses, and also to cold meats and pork pies!